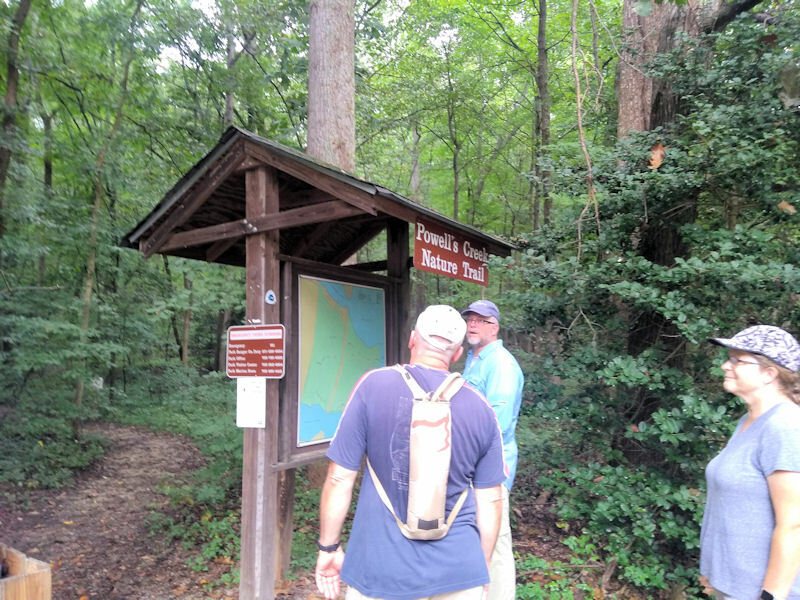 We had 2 short loops for this hike which occured on Saturday, September 1, 2018: The 1.96 mile Lee's Woods Trail and the 1.27 mile Powell's Creek Trail. Participants were Dave McIntyre, Randall Bartlett, Mary Gordon, Nancy and Warren Keithley and Mike Calabrese. In addition, Cub Scout Pack 1373, along with Cub Master Tim Young, his Dad, 4 other parents and 8 cub scouts. We met at the POPUMC parking lot and left at 8:00 AM as usual. We got to the park around 8:27. Waiting for us were 6 parents and 8 kids from Cub Scout Pack 1373 who would be joining us. 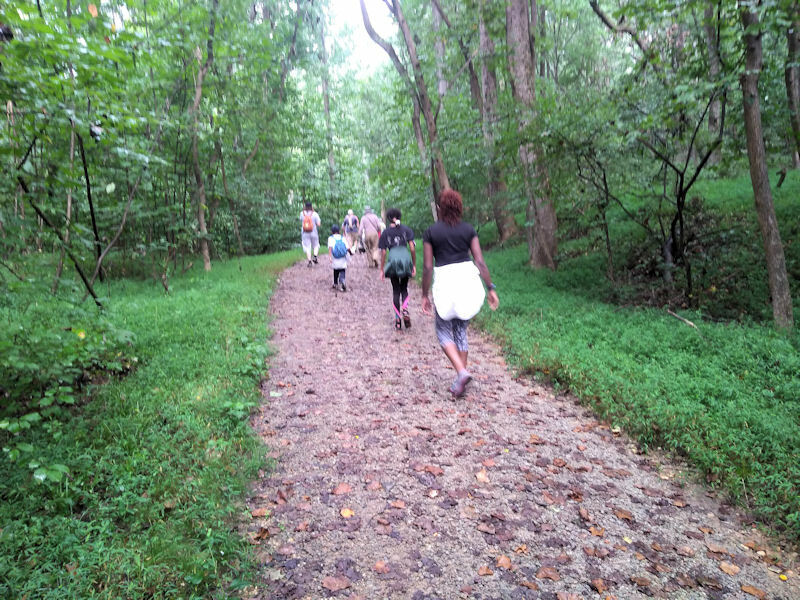 20 participants in this hike. Wow, that is the most people yet for a POPUMC Hiking Group hike! So we tackled the Lee's Woods Trail first. We ascended a bluff and saw where there had been cannon placements used by the Conferates during the Civil War to blockade Washington, DC. Next we hiked past the Fairfax House. All that remains there now is a chimney. We next hiked past the sites of 2 different Lee homes, then ended up at the Fairfax/Lee Cemetery. Now we had a dilema. The cemetery was at the center of a 3 way intersection. One trail said 'Stop 10' and the other said 'Stop 11'. So which way do we go? We tried proceding along the trail marked 'Stop 10' but the trail was closed after about 500 feet. We came back to the cemetery and tried the trail marked 'Stop 11'. We agreed that if this one did not get us back to our vehicles, we would then backtrack the way that we came. Thankfully, this was the correct trail. It led us back to the trail that we had been on earlier. We followed it a short distance, then turned right down the hill and to the end of this hike. 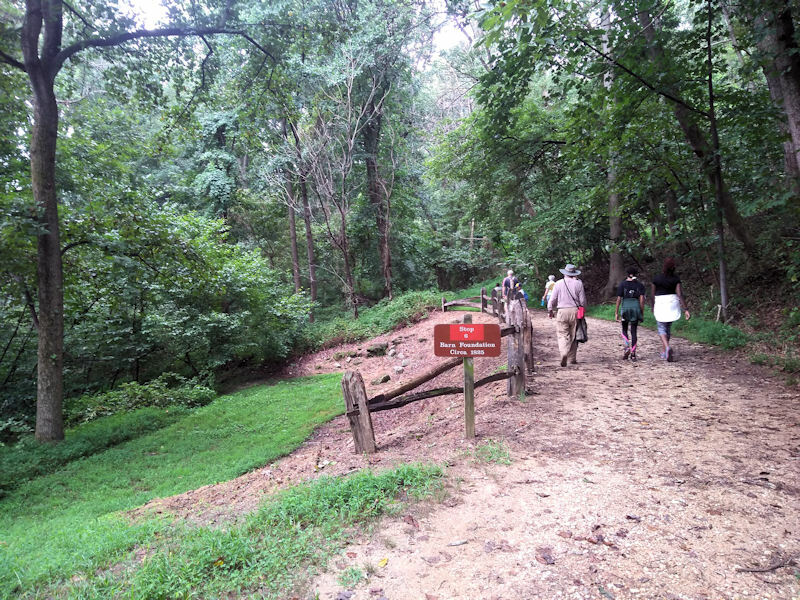 We walked along the Potomac River for awhile, then turned off the trail and towards the visitors center. The scouts left us at this point as 2 miles was enough for them. It was fun hiking with them and interesting in that here you had young kids hiking with older adults and everyone got along fine. We were conversing, laughing and having a great time. One of us remarked that the scouts were very good and didn't complain once about the humidity, the ups or 'are we there yet'. The rest of us took a short rest room break, visited the visitors center and then drove over to the Powell's Creek Trailhead. This trail was shorter than the Lee's Woods Trail. We had a slight up, then were ridging until we came to a scenic view of the Potomac River. 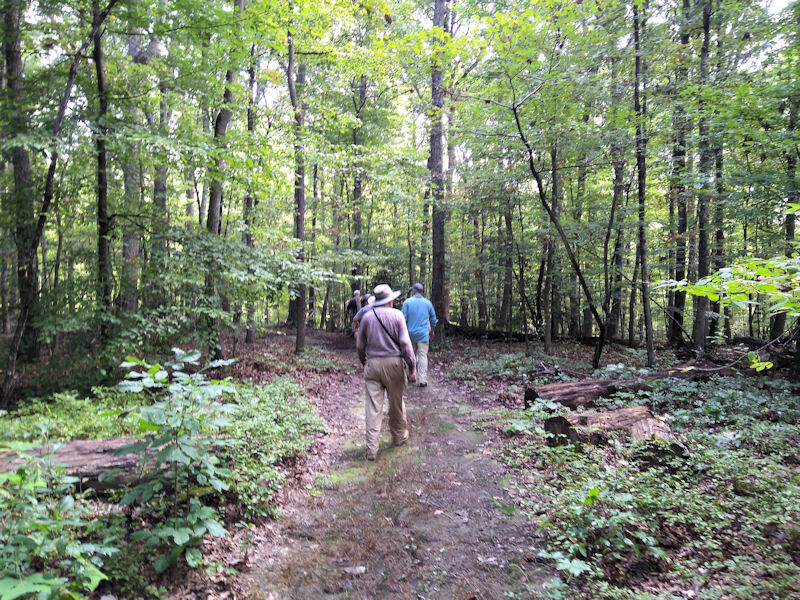 We also hiked on a short stretch of Potomac Herritage Trail, which currently extends from Leesburg, VA to Locust Shade Park near Dumfries, VA. But will hopefully someday stretch from the Laurel Highlands, PA to the Chesapeake Bay, VA. We then took a parallel trail back to our vehicles. This trail had some ups but was pleasant to hike on. We got back to our vehicles, said our goodbyes and made it back to POPUMC by around 11:15 AM. I was very happy that the rain let up for us to hike. I was also very happy for the great turnout that we had. And I look forward to some nice hikes this fall with my fellow hikers at POPUMC! 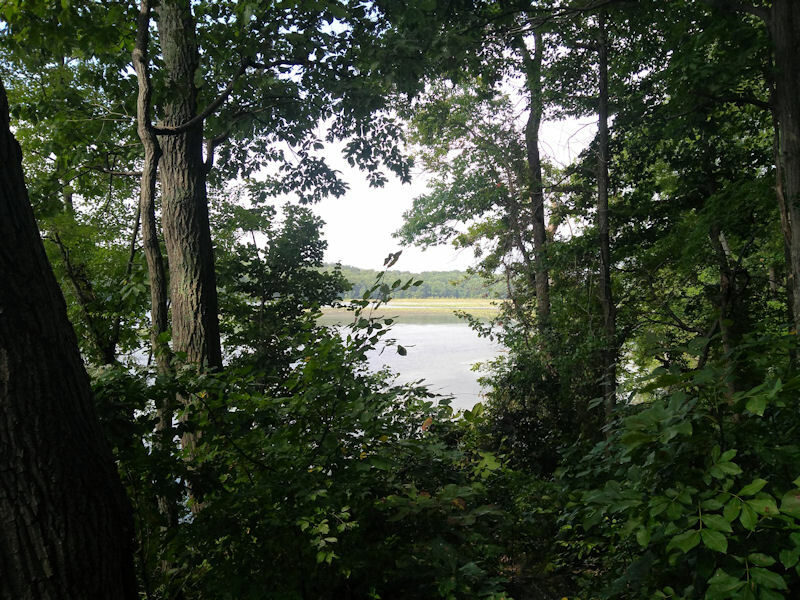 At the time of early English settlers, Leesylvania was believed to be the site of an Algonquian village, overlooking Neabsco Creek. Return loop on Powell's Creek Trail. Scenic view from Powell's Creek Trail. At the Powell's Creek Trailhead. 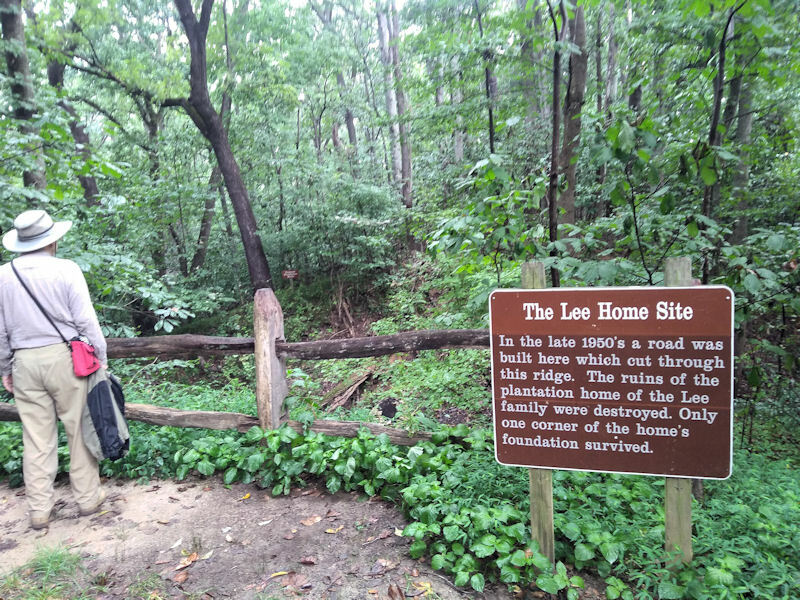 Lee Home Site, Lee's Woods Trail. 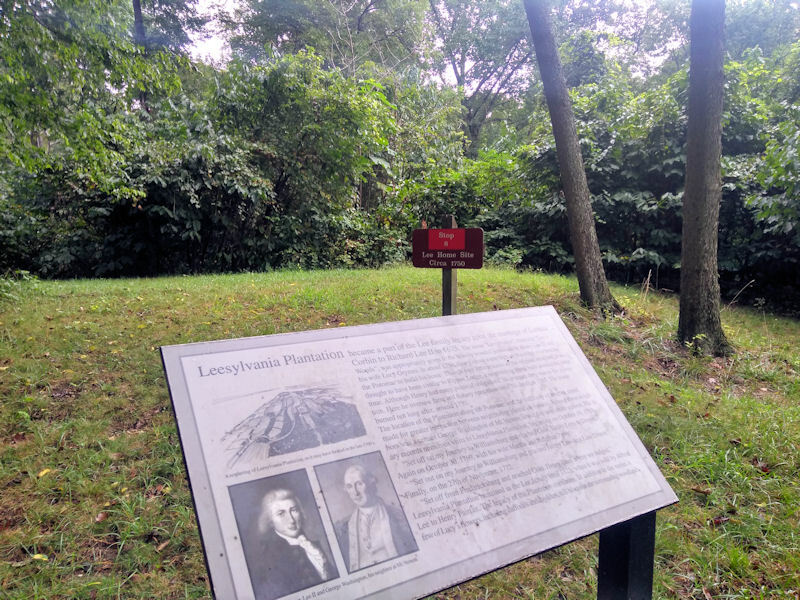 Leesylvania Plantation, Lee's Woods Trail. Barn Foundation, Lee's Woods Trail.